Conversations is a new series of online distributed dialogues and interviews. 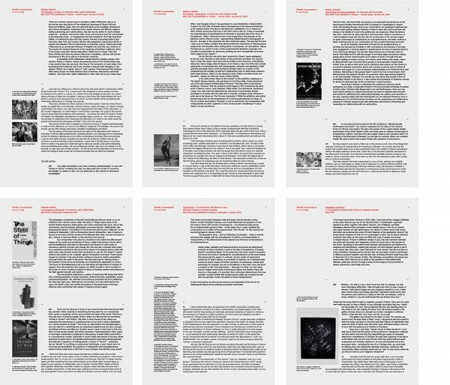 The first collection of Conversations marks that art theorist Mathias Danbolt joined FRANK, a queer feminist platform run by Liv Bugge and Sille Storihle since 2012. In 2013, a Norwegian arts magazine invited FRANK to interview Danbolt about his PhD dissertation Touching History: Art, Performance, and Politics in Queer Times. The interview quickly turned into a conversation – one that continued beyond the pages of the magazine. With Conversations FRANK seeks to create a structure for instigating new dialogues of this kind – dialogues that unfold across and between different aesthetic, theoretical, historical, and political positions. Conversations continues FRANK’s long-term work on creating platforms for exchanges and discussions on the politics of art, gender, sexuality, and racialization. The conversations published here builds a bridge between Danbolt’s project Trikster–Nordic Queer Journal (2008-2010) and FRANK, by presenting a selection of his previous interviews, alongside unpublished and new dialogues. Triksterwas an early inspiration to FRANK, with its aspiration to nurture a critical discourse on queer feminist art and politics. Now this aspiration has found a new framework, in the form of Conversations. Conversations can be downloaded here. Renate Lorenz and Ester Fleckner. FRANK is an Oslo based platform, established to nurture art and critical discourse revolving around gender, desire and sexuality. The platform operates in different locations and with various co-curators. Our aim is to build a community and create discussions that address hegemonic structures in society. Since 2012, the artists Liv Bugge and Sille Storihle have run FRANK. The art historian and queer critic Mathias Danbolt joined FRANK in 2015.